Clydesdales Are Back And This Time They’re Delivering A Special Tree To Town! The temperatures are finally falling. The air is crisp, Thanksgiving is behind us, and within just a short time, it will be Christmas. I have more than a few Christmas carols stuck in my head! It is hard to get away from the fact that we are only about a week and a half away from Christmas! Are you ready? Is your shopping done? 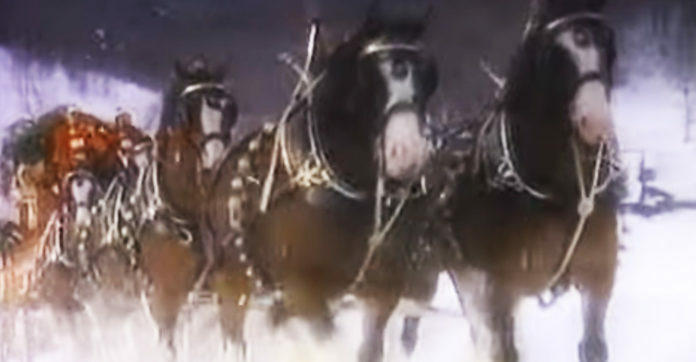 To help get you in the holiday mood here is a classic Budweiser Christmas commercial. It is from 1987 and will have you walking down memory lane when you see it again! IF you have never seen it – enjoy! It is a classic. Having the Clydesdales deliver our trees would be a lot simpler than strapping it to the roof of the car! Well, we don’t all have access to a team of horses, but we can get a tree home and enjoy our holidays! Share away, people!